There is still time to play along with our current challenge at Time Out. Our challenge this time is a CASE challenge, and we have this amazing card by Cornelia to inspire us. 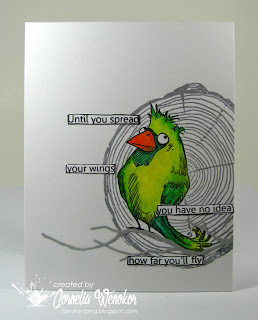 I was inspired by that adorable crazy bird, the background behind the bird, and the way Cornelia did her sentiment. Although I have the same bird stamps, I decided to use my crazy dogs for this card. I stamped and colored my pup, and then masked him off to stamp the woodgrain mat background behind him. I stamped my sentiment on a piece of scrap card stock, and then cut it out and adhered it with foam tape. Please head over to Time Out to see more inspiration from our Design Team and Guest Designer. Our Guest Designer this week is Pooja, so please stop by her blog to see what she has created for this challenge. Happy Little Stamper is our sponsor for this challenge. Details for the prize are on the Time Out Challenge Blog. How cute is that puppy! Adorable!! I by-passed the crazy dogs but I love this one on your card, Joyce. The expression on that dog is priceless! What a fun card! What a fun take on the challenge. That pup is adorable!! Interesting blog and I really like your work and must appreciate for your work for the Birthday wishes. Your puppy is as cute as can be Joyce! Love that stamp so cute! A perfect masculine Birthday card - I just love the expression on that crazy dog's face :) Really fun CASE!!! Oooooo I have forgotten all about that woodgrain mat stamp! You have used it wonderfully for this clever CASE! Love that dog too! I love your beautiful and fun card!